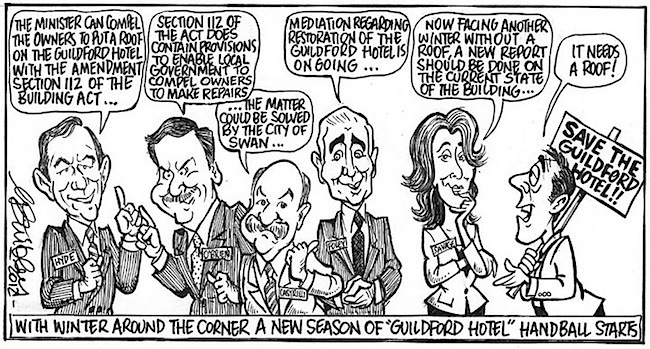 Saving an icon seems to be mission impossible for the powers that be, when it comes to the landmark Guildford Hotel, which continues to sit in ruins six years and counting after it was severely damaged by a suspicious fire.. 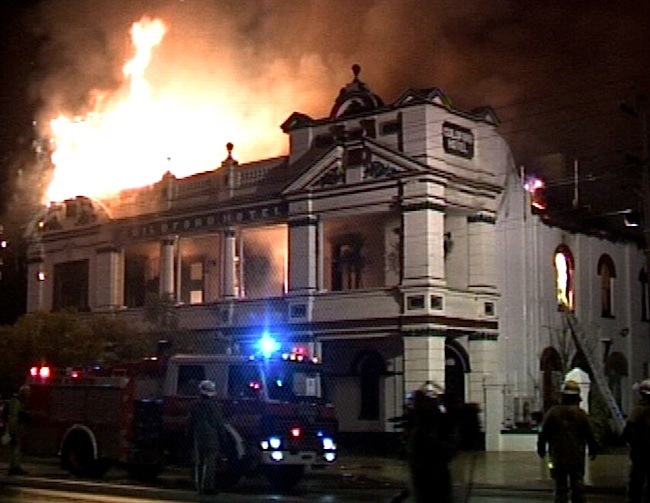 The iconic and heritage-listed Guildford Hotel was suspiciously damaged and burnt-out by a fire in September 2008, and since then its ongoing dilapidation has continued to draw the ire of the public and community leaders. The now charred hotel on James Street was built in 1883 and licensed in 1886. The following year the hotel owner built a vaudeville theatre next door. A building that still stands today, but now is a display warehouse for Oriental Origins, a trove of exotic sculpted and crafted objects and furniture. 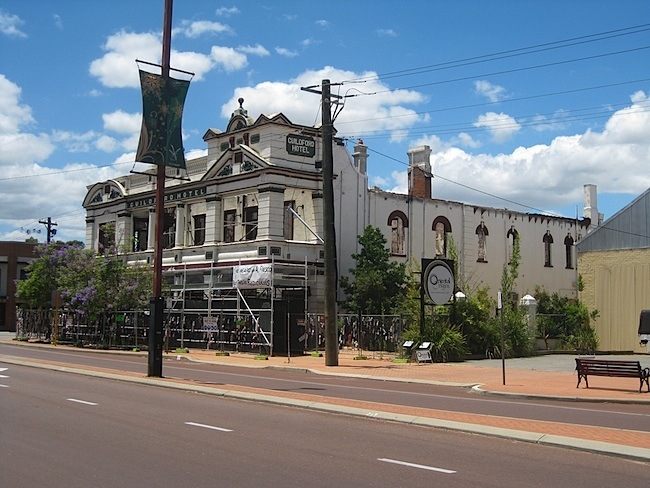 A Save the Guildford Hotel rally was conducted in February 2013. The protest was held at Stirling Square, near the Swan Valley icon, and was the third rally since the venue was engulfed by fire. The owners have approval to rebuilt, but they say they will only do so if it is financially viable. Meanwhile the Heritage Minister told the people of Guildford that the State Government can’t do more than they have. 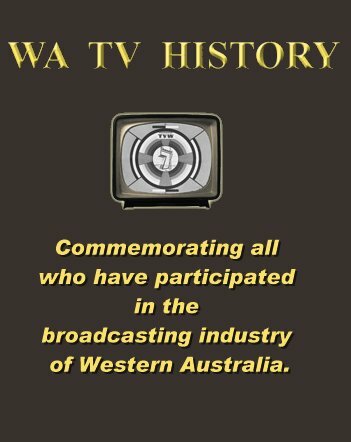 The Western Australian Labor and Greens parties made election promises at the rally, to fine those who neglect heritage buildings or take the properties off them. The Labor party would examine the possibility of purchasing the site if all else fails, whilst the Greens would push for changes to the heritage act that would make owners of neglected heritage buildings liable for fines of up to $1 million. Owners of heritage buildings who neglect their properties to hasten demolition will be liable to fines of up to $1 million as part of a package of heritage initiatives to be released by the Greens in 2013. 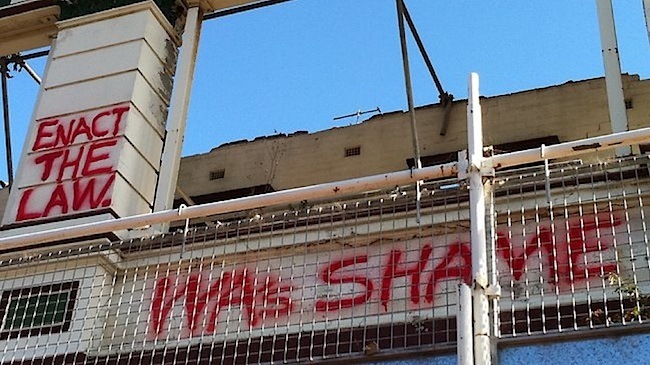 The initiatives are designed to protect the state’s heritage listed properties by outlawing the practice of demolition by neglect and requiring conservation management plans for all places on the State Heritage Register. Meanwhile, the Liberal spokesperson said that could not happen while the owners were working towards redeveloping the land. Braddock said the priority had been to make the site safe and secure to preserve the façade and salvage as much as possible. “Professional advice as to the structure and condition of the remaining fabric has been adopted and the building is being closely monitored. The structural engineer has confirmed that the building is not being compromised by the lack of roof cover,” he said. “We continue to collaborate with Heritage Council, City of Swan and other consultants to produce a sustainable plan for approval that will retain the building façade and iconic bell tower,” he said. 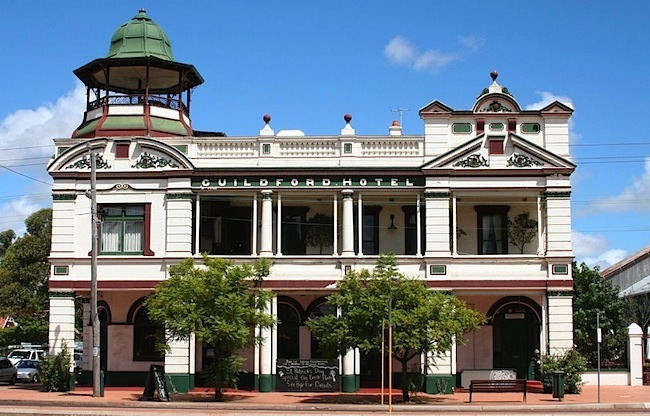 In 2011, The Guildford Hotel Redevelopment Group submitted a formal application to the City of Swan for the redevelopment of the heritage listed hotel and adjacent land. The redevelopment concept comprises a refurbished hotel in its original elegant, neutral‐toned heritage colours, with a wine‐bar or boutique brewery, restaurant, bar area, al‐fresco dining and beer garden. An up‐market liquor store is proposed abutting the south wall of the hotel. Upstairs, the proposal incorporates boutique accommodation and a function room. It is proposed that the southern portion of the site comprise a small retail complex that will reflect the architecture of the hotel. There was public consultation and approval obtained for the development, after they haggled over the conditions. The owners then marketed the property to attract tenants (deadline for applications was March 29th, 2013). The next stage was to seek finance, then tender for builders and start construction. 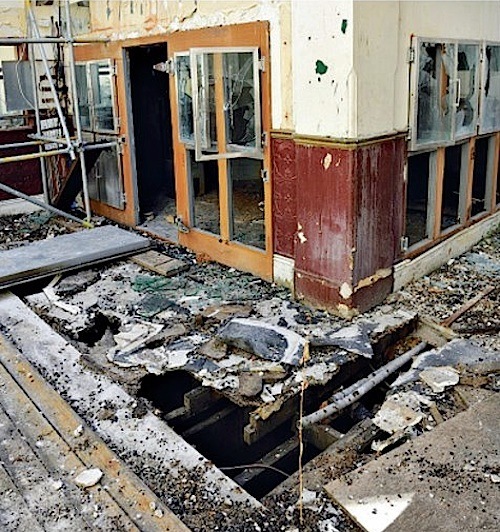 Almost a year later the hotel is still sitting awaiting restoration whilst vandals have begun ripping up the floorboards that the firemen saved from the blaze. 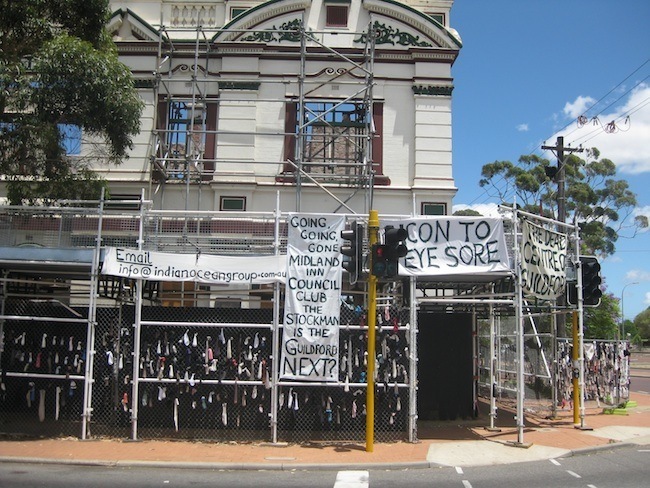 Meanwhile, slogans such as “save me Colin, stop the fires”, “never in Cottesloe”, “white-collar crime in progress”, “WA’s shame” and “enact the law” have appeared on the building’s walls.